Spider-Ham. The Spectacular Spider-Ham. 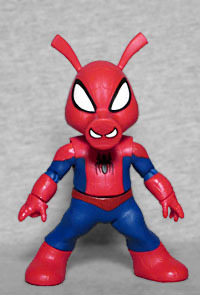 A real toy company has made an official Marvel Legends version of the spectacular Spider-Ham. What an amazing future we live in! Part pig, part spider, part scientific mishap, Peter Porker becomes the web-shooting swine, Spider-Ham. Spider-Ham first appeared in a 1983 one-shot titled Marvel Tails before spinning off into his own bi-monthly series that somehow managed to run for three years. The bio hints at the first version of his origin (there have been several), in which he was a normal spider who was bitten by a radioactive pig. A normal anthropomorphic spider. Because that's "normal" on Earth-8311. Also the radioactive pig in question was May Porker, who was experimenting on an atomic-powered hairdryer. And this all made her think she was Peter's aunt somehow. If comics are weird and goofy, comedy books are even weirder and goofier, but at least there they're in on the fun and not doing it by accident. 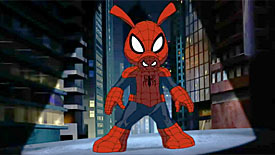 Spider-Ham has always been an anthropomorphic cartoon pig in a Spidey suit, not just a human with an animal head, and that's what this figure delivers: standing not even 3½" tall (including the ears), this is a superdeformed little toon. In fact, he's, like, specifically a toon: this design, from the shapes of the body to the very pose he's standing in, come from an episode of the Ultimate Spider-Man cartoon, when Peter Parker was imaging himself being scattered to alternate dimensions. Other than being "a cartoon pig," Hammie doesn't look all that much like his comicbook counterpart. 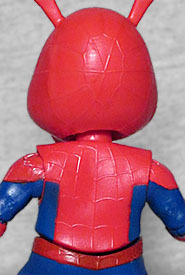 The character was always drawn with a very specific style this toy doesn't even attempt: the head is too round, the body is too wide, and the spider-symbol on his chest is too modern. At this rate, we're lucky they remembered to match the lenses of his mask on the end of his nose. 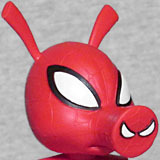 Spider-Ham has better articulation than you might expect for a swine of his size, with a balljointed head and waist, swivel wrists and boots, and swivel/hinge shoulders and elbows. The distinctive shapes of his limbs don't really lend themselves too well to movement, however - when the forearms is oval, turning the wrist at all means the parts no longer look like they're connected. There are no useful joints in the legs, but at least the wiast gives a lot of fun options, huh? But honestly, Peter feels a little bit too large when you stand him next to other figures - like, this is a good height, but it'd be a good height if he wasn't standing with his legs spread way out. He should be this tall standing straight up. The paint should have been better, too. We're not talking about the way the red on his chest doesn't match the red of his belt, because that's an issue of painted colors vs. molded colors, and those are always at least a little different. No, the problem is the webs: every web on his costume has been sculpted in, but there's no paint to bring out the details. It makes him look more cartoony, sure, but are not we meant to at least believe this is the comic version? And even the animation was smart enough to keep the webs black, so why skip them here? And would he look good if I took the time to paint them myself, or would he look "busy"? Spider-Ham comes with two pieces of this series' Monster Venom Build-A-Figure: the torso and the back. Why are those packaged separately? Because the BAF is just that big. They don't click together like most BAF pieces, so you can test putting them together for a hint of his size. 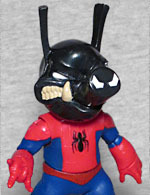 Additionally, the set includes an alternate head, which looks like a Venom-ized version of Spider-Ham. Which, in a way, it is. But we'll talk about that more tomorrow. 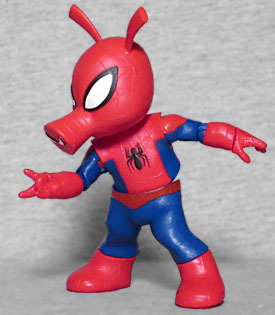 Given Spider-Ham's size, construction, and so-so articulation, you almost have to wonder if he was planned as a BAF himself at some point - after all, he's not significantly more complex than Rocket Raccoon or Hit-Monkey were, so it's possible there was going to be a four-figure Spider-Man series that would have let you build him. His small size really works out for this Venom line, though, because it allows Hasbro to go nuts with the extras.